Tests of controls are performed to obtain evidence of compliance of controls established by the client. Substantive tests involve performance of procedures to obtain direct evidence about the amounts and disclosures in financial statements. Basic objective of substantive tests is therefore, providing evidence as to credibility of account balances and disclosures. 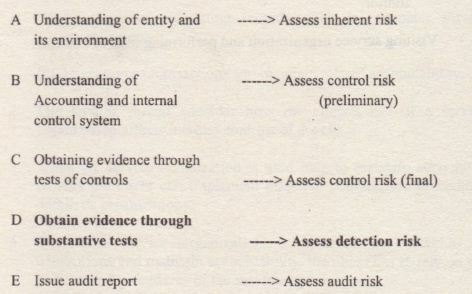 Tests of controls are generally applied to provide evidence as to assertions about transactions during the period. Substantive tests are performed to obtain direct evidence as regards financial statement accounts. 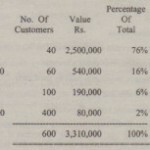 To determine that sales invoices are independently matched with delivery notes. Select 40 sales invoices and match with delivery notes. – Trace invoices to purchase day book. evidence includes suppliers’ invoices, purchase orders and goods receiving reports. Corroborating audit evidence may be available both form the client and from outside sources. Examples of evidence available from client are cheques, purchase orders, sales invoices, delivery notes, minutes of meetings, and inquiry from client’s personnel. External evidence includes confirmations from customers and suppliers’ for entity’s assets held by third parties and letters from the lawyers. The detection risk has been sub divided into analytical review risk and risk of detailed testing. It implies that lower the extent of reliance on analytical procedures, the more expanded detailed tests will be required to reduce the detection risk. Conversely, if in the auditors’ judgment, the analytical procedures can be largely relied upon to detect material misstatement in financial statements. 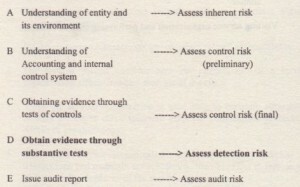 The auditor can reduce the extent of detailed testing. 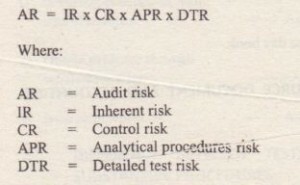 Assume that acceptable audit risk is 2%. The inherent risk is high, 80% control risk is moderate, 50% and the auditor does not plan to carry out any analytical procedures, the analytical procedures risk is assumed to be 100%, the detailed test risk works out to be 5%. In case the auditor performs some analytical procedures and thereby he can reduce analytical procedures risk to 50%, the detailed test risk can be increased to 10% with the audit risk still restricted to 2%. The verification of profit and loss accounts normally involves tests of controls and analytical procedures. In practice, generally extended substantive procedures are not applied on profits and loss accounts except analytical reviews. AUDIT EVIDENCE IS GENERALLY PERSUASIVE RATHER THAN CONCLUSIVE. Persuasive means any evidence that may cause a person to believe a fact. Conclusive means decisive and convincing. In many cases the auditor has to rely on evidence which is only persuasive rather than conclusive. This is because generally it is difficult to obtain conclusive evidence. The auditor will verify ownership of land by inspecting title deeds. The auditor is not an expert on authentication of documents. It would be enough for him to verify that the deeds are prima facia in order. • Inquiry from the client on the collectability of balances. The above evidences are by no means conclusive that the allowance for doubtful account has been correctly stated. Also, when a loss contingency exists, the likelihood that a future event may occur can range from probable to remote. It may be difficult to make a reasonable estimate of the amount of the contingent losses. In such cases there is no way to obtain evidence on such matters from the company lawyer. Such evidence will only be persuasive and not conclusive because the lawyer himself would be unable to give an opinion on an unsettled litigation. The sufficiency of audit evidence means deciding as to what extent the evidence should be obtained to achieve the required level of assurance. The amount of evidence required depends in part on the degree of risk of misstatement, the materiality of the item, past experience with the client and the quality of information available. (b) reliability of evidence in verifying a particular assertion.